PCOM Library / Library News / DynaMed Plus is Now Available! PCOM now has access to DynaMed Plus! Get answers to your clinical questions fast! 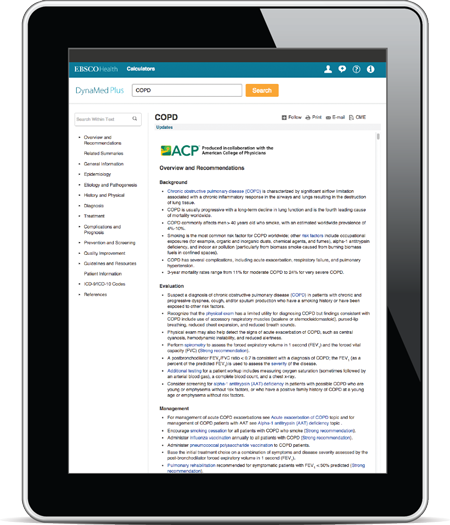 DynaMed Plus presents critically appraised evidence from more than 500 medical journals in a quick, easy-to-read format designed for use at the point of care. Concise Overviews and Recommendations – accurate overviews for the most common conditions as well as evidence-based recommendations for action. Micromedex® Clinical Knowledge Suite* drug content –includes medication management and lab recommendations, including IV screening, medication advisory screening and summary drug info. Graphics and Images – includes over 2,500 medical graphics and images with over 1000 images from ACP. Specialty Content – DynaMed Plus includes a wide array of specialty topics in areas such as infectious disease and immunology, cardiology, oncology and emergency medicine. Mobile Access – DynaMed Plus is easy to access from any mobile device, from anywhere in the world. Download instructions are available here. Expert Reviewers – DynaMed Plus includes subject-specific experts who review topics using the DynaMed Plus proprietary 7 Step EBM Process and the 9-Step Quality Process for creating content.